We celebrate Mooncake Festival today. It's a harvest celebration and it is an important part in the Chinese culture. This festival is celebrated on the 15th day of the 8th month in the Chinese lunar calendar. The day where the moon is at its fullest. Unfortunately there is nothing big here to celebrate this festival, only a tradition to eat our mooncake. This year I bought snow skin mooncake to celebrate. They are beautiful with sweet filling inside. Sorry for the dull picture that I took this afternoon along with the kids' rabbit snack that I made. It was raining outside, all dark so the only choice was to take the picture in my dining room. I remembered when I was a kid in my hometown, we would bring a colorful lantern and walked around with a group of kids during this festival. My kids never get a chance like me, perhaps next year I should buy some lanterns and let them know the whole thing about this festival which I also start to forget too except for the part of eating mooncake. I got 2 new Akinoichigo's bento books in my shelf. I posted before about her bento books here. I like to collect her bento books. Great learning from her very inspiring bento. Both books contain a lot of tips and character patterns that we can copy from. 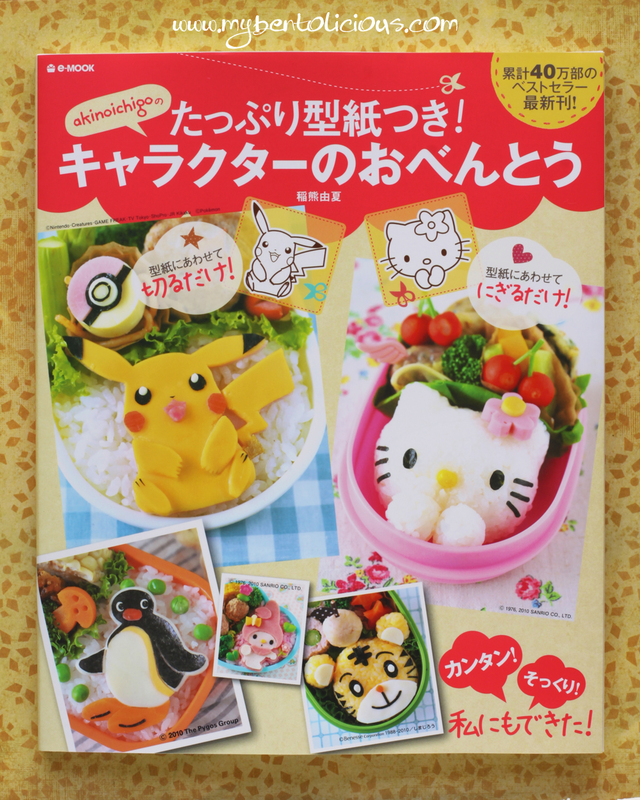 And the newest bento book is even better because for every bento there is some pictures accompanied along on the side. Those pictures are very helpful especially for non-Japanese reader like me, so I can get the idea how she does it. I only wished that her books were in English, it would be more resourceful. You can get these books from buying online at Amazon.co.jp or you can find it at Kinokuniya Bookstore. Happy Moon Festival! We never did lanterns but there were always mooncakes. Snowskin looks so pretty and colorful. Lucky to have those bento books to enjoy! The pictures are so beautiful. Happy Mooncakes Festival!!! I remember back then I always got to eat mooncakes from my friends and neighbors, even tough we did not celebrate it. We watched all about the moon festival on Kai Lan..lol The girls loved learning about it and want to make lanterns themselves now. Happy Moon Festival! 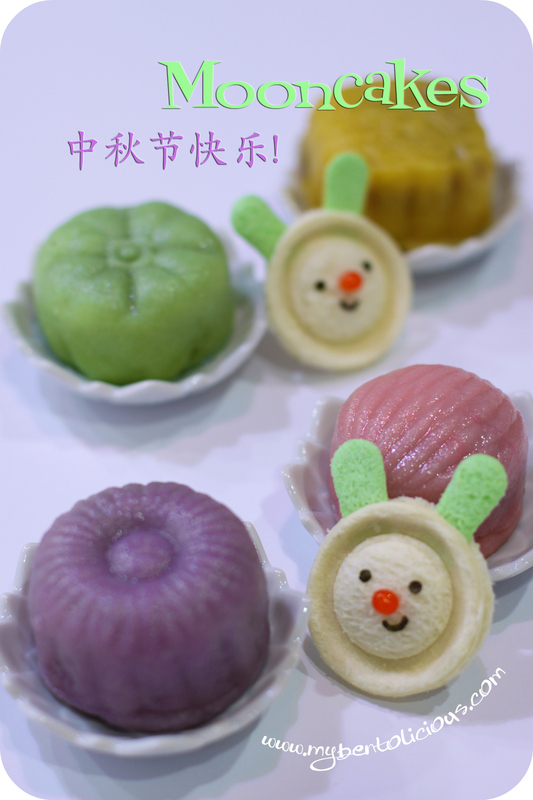 those mooncakes are lovely, and the bunnies are so cute - where did you find the green bread for their ears? i LOVE akinoichigo's work - wish i could find her books at a store near me (so expensive to ship from japan)! Blessed Belated Mid Autumn Festival to you and your family! I am drooling over your picture of cakes. I love the cake so much, sometimes have to remind myself about the calories! LOL What a coincident that last night, I also bought a book on Kinokuniya. I have spent some time in bookstore, trying to make up my mind, which one should I buy he he he. I agree with you that good books will help a lot! I love the color of the mooncakes! 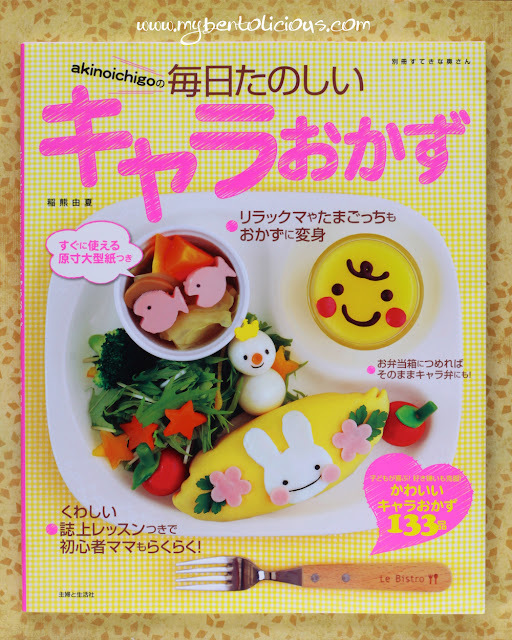 Thanks for new bento books to find for my collection - I love the cover of her books. they are so nice!! check out my latest post on yogurt mooncakes!